I discovered this charming little story in The Graphic magazine Christmas number for 1880. The colours have faded to blues and browns I’m afraid, but then it is over one hundred years old! The 23 comes every ten minutes, and starts at the station, so if you aren’t at the front of the queue and able to run upstairs to claim a front seat then it is worth waiting for the next one and being the first person on. You are right on the edge of the City of London here – Spitalfields was outside the Roman and medieval walls – and we are going to travel through every era of London’s history from the Romans to the present day. The bus sets off down Old Broad Street (a Roman street), crosses London Wall (no prizes for guessing what that’s on the line of) and takes a slight bend to the left, just before Turnbull & Asser’s shop – if you look to the right you’ll see Austin Friars, the reminder of a large Augustinian monastery on the site. Now we turn right into Threadneedle Street (a reference to either the Company of Needlemakers or the Merchant Taylors) with the Royal Exchange on the left and the Bank of England (1788) ahead on the right. The Royal Exchange is the Victorian rebuilding of the trade centre that has flourished here since Tudor times. 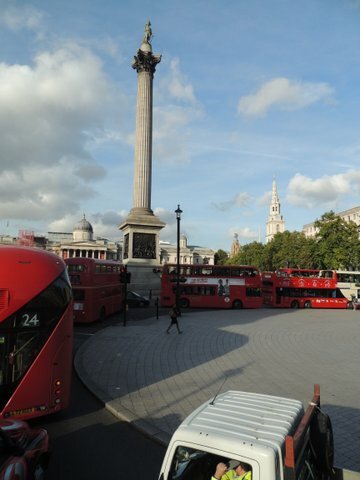 This is a great place to get off on another day for exploration on foot – the George & Vulture tavern, the Monument, the Bank of England Museum and London Bridge are all close by. If you look out to the left you will catch glimpses of the Thames and it is also fun to spot the street names that go back to the pre-Reformation Catholic past of the area – Ave Maria Lane, Godliman Street, Creed Lane, Pilgrim Street. The bus passes the cathedral (also the site of a Roman temple) and dives down Ludgate Hill towards the valley of the River Fleet. 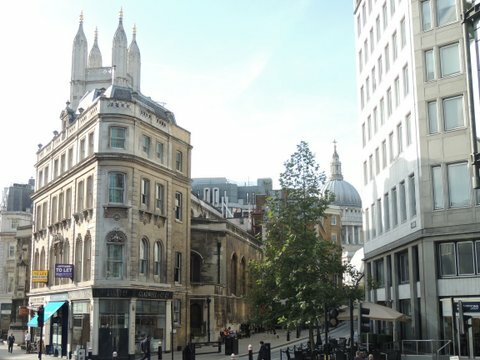 Look out on the right, just after St Martin’s church, for the Old Bailey, leading to the site of Newgate Prison, now under the Central Criminal Courts. The triangular area in front preserves the shape of the area where public hangings were carried out when they were transferred from Tyburn, the end of our journey today. The area immediately to the south, being redeveloped at the moment, was the location of the Belle Sauvage inn, one of London’s oldest and a major coaching terminus. Look up Limeburner Lane immediately after this building site – the curve of the buildings reflect the shape of the walls of the Fleet prison. 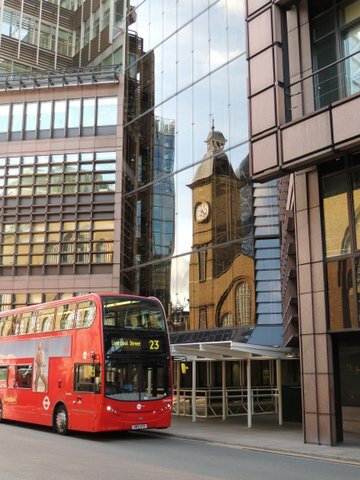 The picture below shows Ludgate Hill. When you reach the bottom of Ludgate Hill you would originally have been on the Fleet Bridge crossing the open stream. Gradually it was covered over but it still runs beneath the street, as do all the ancient rivers of London. To your left New Bridge Street runs down to Blackfriar’s Bridge (1769), with the site of the Bridewell prison on its west side, and if you look up to the left you will see the “wedding cake” spire of St Bride’s church, reputedly the building that inspired a local pastrycook to create what became the modern wedding cake. Now we are climbing out of the Fleet valley up Fleet Street, one of medieval London’s major thoroughfares and once centre of the publishing and newspaper industry. Look out on the right for Ye Olde Cheshire Cheese, a seventeenth and eighteenth century tavern frequented by Dr Johnson. 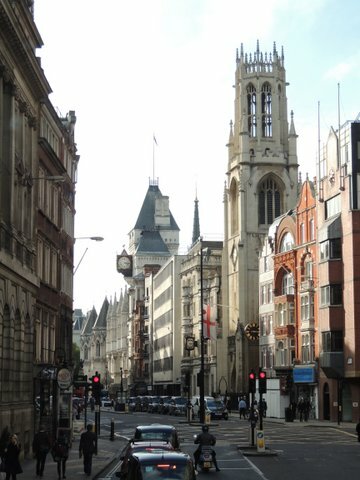 Ahead on the right you can see the clock of St Dunstan’s church protruding out over the street (church tower in photo below with Royal Courts of Justice behind). Almost opposite this, at number 32, John Murray, Jane Austen’s publisher, had his offices. He was there until 1812 when he moved to fashionable Albemarle Street, Mayfair. Just past this look out for the Inner Temple Gateway (1610), a survivor of the Great Fire which stopped just short of it. In the middle of the road is the Temple Bar monument, with the City of London’s griffin roaring defiance at the City of Westminster which begins just the other side. Even the monarch, on state occasions, will stop at the Bar and be greeted by the Lord Mayor before proceeding. 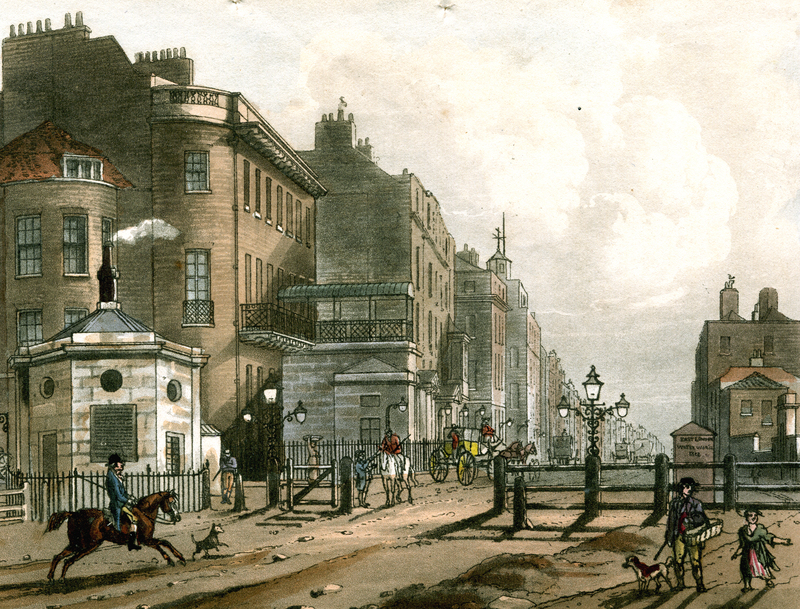 Temple Bar itself was moved in the 19th century as a traffic hazard and is now in St Paul’s churchyard. We are driving along Strand now, an 11th century street originally on the river bank or strand. We pass St Mary le Strand (location in the 17th century of the first hackney carriage stand ) and come to Somerset House on the left. It dates back to the mid 16th century and was a royal house in the 17th century. By the time Jane Austen knew it the Royal Academy, the Royal Society, the Society of Antiquaries and the Navy Board all occupied wings. We pass the turning down to Waterloo Bridge (1817) and continue along Strand. All the pre-Victorian buildings have gone now, but just past the Savoy Hotel on the left was the Cole Hole Tavern, home to the Wolf Club, founded by actor Edmund Kean, so he said, for men whose wives did not allow them to sing in the bath. Rudolph Ackermann’s famous Emporium was also close by. On the other side of the street, on the site of what is now the Strand Palace Hotel, was the Exeter Change with its many small shops and Pidock’s (later Polito’s) Menagerie. It was located, bizarely, above ground floor level and contained, amongst other live animals, a hippopotomus that Byron said resembled Lord Liverpool, and even an elephant. Ahead of us now we can see Nelson’s Column, but before we reach Trafalgar Square we pass Charing Cross station on the left. 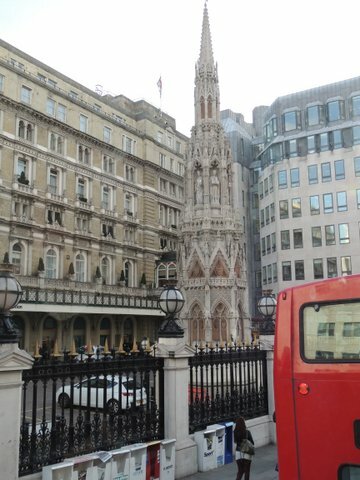 In the forecourt is the Victorian replacement for one of the twelve Eleanor Crosses that stood on this site. They were erected by King Edward I to mark the places where the funeral cortege of his wife – his chere reine (=Charing) – stopped in 1290. 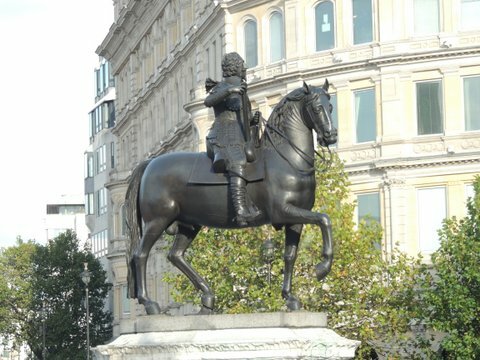 The original cross stood a little further along where the statue of King Charles I is now, looking down Whitehall towards his place of execution. The Parliamentarians pulled down the old cross in 1647, but when Charles II was restored to the throne he had eight of the regicides hanged drawn and quartered on that spot. We skirt the southern edge of Trafalgar Square, developed in 1840 from the chaos of the royal mews, inns, barracks and shops. To our left we can look down Whitehall to Westminster Abbey and the Houses of Parliament and through Admiralty Arch down the Mall to Buckingham Palace. Across the Square is the National Gallery (some of the pillars were reused when the Prince Regent’s Carlton House was demolished) and St Martin in the Fields. The bus will leave the Square by Cockspur Street. Look out to your left for an unprepossessing alleyway, Warwick House Street. Once this terminated in Warwick House, home of the Regent’s daughter Princess Charlotte. 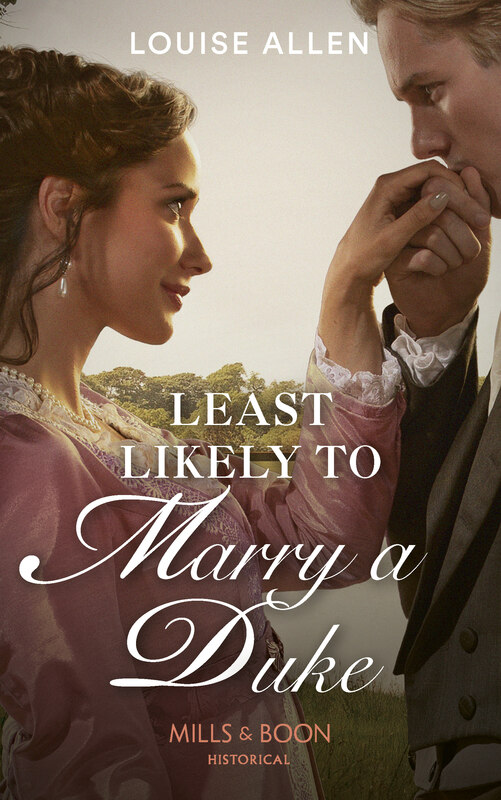 He tried to separate her from her mother, his estranged wife Caroline, but one day Charlotte sneaked out of the house and fled down to Cockspur Street where she took the first hackney carriage and fled to her mother. We pass the foot of Haymarket – home to the market selling, amongst other things, hay and fodder for London’s thousands of horses. It was also notorious for its prostitutes – Haymarket Ware. 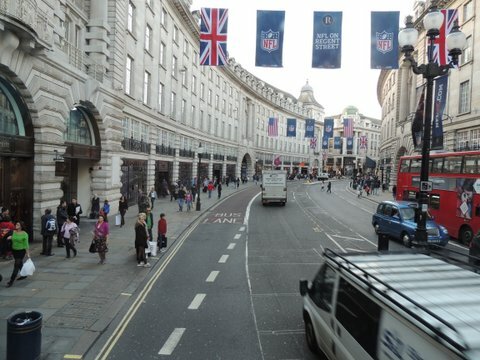 The bus crosses Waterloo Place and turns up Regent Street. Behind us is the Duke of York’s Column, overlooking St James’s Park. All along that side of Pall Mall stretched Carlton House, once intended to be the culmination of Nash’s dramatic Regent’s Street redevelopment begun in 1816. But Carlton House was demolished in 1826 after the Regent became George IV and moved into Buckingham Palace. All Nash’s original buildings have been replaced as the requirements for modern shops have changed, but the scale and the style remains much as he envisaged. The new street cut though London, separating the squalor of Soho to the east from the riches of fashionable Mayfair to the west. At Piccadilly Circus – always an awkward shape – we continue up Regent Street to Oxford Circus and turn left into Oxford Street. In the late 18th and 19th centuries it already had a name as a major shopping destination and, as Ackermann’s Repository had it, was “allowed to be one of the finest streets in Europe.” Only one feature remains that is older than the late 19th century and that is one pillar of the entrance to Stratford Place and, as I write, it is shrouded in a protective box while works on Bond Street tube station are carried out. 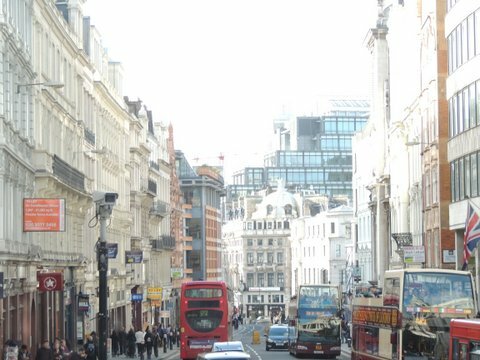 But one very ancient feature of Oxford Street can still be experienced from our position on top at the front of the bus, and that is the valley of Tyburn Brook which crossed Oxford Street on its way south. On foot you hardly notice it, on the bus it is a definite dip, just where the entrance to Bond Street tube station is. We climb up the other side and continue along to Marble Arch where I suggest leaving the bus. This is the location of the Tyburn gallows, notorious place of public execution, and also of Tyburn turnpike gates marking one of the main entrances into London from the west. From here you can stroll south-east into Mayfair or into Hyde Park – the very edge of Regency London. On the left is a print from Ackermann’s Repository showing the view eastwards along Oxford Street from the Tyburn turnpike gates. Hyde Park is to the right.